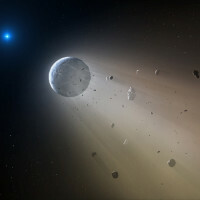 Astronomers have discovered evidence for a rocky planet being destroyed and material from the planet being accreted onto a white dwarf. The object was identified using data from NASA’s K2 mission and characterized using multiple ground-based observatories, including MINERVA. See links below to read more about a recent discovery based by a team of scientists, including Penn State Professor Jason Wright.